-The textfile Misc.txt was mistakenly replaced with an older version. This means that mana/health potions are based on attributes again. It also breaks merchants selling of multiple gems of the same type (i assume this is just startsone, moonstone, and uber gems). Things below here are mainly reference. It includes things that simply cannot be fixed as well...it is worth a read at least once for anyone that chooses to mod. Only happens with Find Potion/Item. These are not useable (are regular juvs acting like regular healing potions, and full juvs simply not functioning?...that or neither work). Consider it a trophy, or a virtual paper weight. -They appear because these skills are hardcoded. Yes. This will happen. This is a conflict with wereform as far as I remember. Don't trust the one that doesn't transform either. Skills, at minimum, conflict. Isolated Purgatory 2 crash: possible fix is given here (likely now outdated. The map has been changed to default cave colorings (still no automap enabled)). -Not really a bug, but a concern. Oblivion Knights Amplify Damage spell is reducing physical resistance by 100%. This does not seem to be in line with other monsters Amplify Damage values. Likely they are using the wrong Amp version. (likely outdated, amp values are changed. Still is probably good to have this for posterity). 6FD0AAE5 should be the value for monsters' amp. Smite's skill damage description function is very hardcoded. It was coded to never accept the existance of damage synergy possibilities like how defiance was coded into it. If it wasn't for the fact that any other skill description function would display a 0-1 damage on the character screen for smite I'd use an other skill description function so that it can display in the skill description damage listing properly. It's really there, but the skill description is just too hardcoded to accept its existence. The following cannot be fixed via text edits, but people should be aware of them. Some hit/gethit skills will not function, or are buggy. Don't forget about these if new updates are done, and somebody thinks of something 'neat'. These include, but may not be limited to, Valkyrie, Bladeshield, Blade Fury, and Rabies. -Auras from completing sets will not cooperate with each other. (Like Hsarus' Defiance and Milabrega's Sanctuary), or even from set and one from another item. -Oskills and +class skill from different sources will not stack. It will cause issues with even using a skill (Absolute Zero oskill and Laying of Hands class skill for Frozen Armor) if you are not of that particular class. I am not sure what happens if you are actually of the 'correct' class (sorceress in the mentioned case. I am told that the above is not necessarily true. I have only vague recollection of those two items clashing as they stood at that time. Edit (1-06) 1.5, and cleanup. Last edited by kramuti on Wed Aug 29, 2012 11:24 pm, edited 55 times in total. Remove this please. If other things pop up I will give this another go. Since this is still stickied and it has gotten a good number of views since I last looked I will try to update this towards the end of this week. If you know of anything that is not on this list, tell me please. Tell me if I miss fixes, too. I have not kept as up to date lately due to a lot going on. it works, a few people have had that problem, re download the small update and run dmodsetup to be sure. smite cant be fixed with a txt edit, it uses a unique skilldesc descdam number that reads only damage from smite and holy shield. Last edited by Steel on Sun Jan 02, 2011 5:26 pm, edited 1 time in total. I have the fixed file already good to go. i will change the notes again once the fixes are disseminated . Good show Rage. Sorry for the misleads. * Mana burn bug fixed - enemies now burn mana proportional to their damage. Has this been looked into? I had a manaburn monster in act1 norm crush my 700 mana bulb in 1 hit. The exceptional belt strength requirements look a little messed up. Battle belts require 88 strength while the war belt only requires 70. Shouldn't these two be switched? hmm - that was an error that was in there from earlier versions, I didnt tweak belt strengths. Can be fixed up next time though. I'm not sure if this has been said or not, but wisp has 100-511 magic damage instead of 100-800. Since i will be wearing two on my Magic Zealer, I'd like that extra 600 damage =D. I apologize if I have been redundant! Wasn't that changed, Blue? Or was that just for weapons? AFAIK it was never changed. Certainly not for weapons. You can only put 511% ED on any weapon, which is why most of the uniques stop at 500%. It's only more on rws because %ed on some is already maxed + you get extra %ed from runes. Now 511% is limit for one roll. It was suggested that these limits(for ele damage) were higher but that topic just got abandoned. also holy bolt... prayer synogy 7168% healed per lvl. something is wrong there, def not getting those results for the lvl of my prayer. Concerning all the things you mentioned. That's because you downloaded the initially available norm/high res full/light mpqs. Those mpqs I had packed incorrectly resulting in corrupted data on the inside that runs without crashing (which results in all the crazy values you just listed). The fix is to download and install one of the new r2 mpq downloads which were properly compiled. You do not have to redownload the core download since it had no mpqs in it in the first place. Last edited by deer_dance9 on Sat Sep 17, 2011 4:15 pm, edited 1 time in total. I'm currently not playing but I'd like to know if hydra fireball issue is going to be fixed (soon) before I start making one. I sent the file before the reset but after things were compiled, so the line just needs to be copied to the newest missile file. Oblivion Knights use moncurse I believe. Chances are theres a minor hardcode needed to fix the phys res reduction, but I'm not in a position to check it atm. I fixed all the errors is skills.txt, I hope to have something for you guys to test before the end of Easter. Bug in tristram - RIP, I could not make screen. Could you explain what happened please? It's possibel that you didn't run D2ModSetup. Edited intial post for 1.41b. 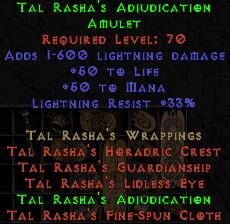 Thought I'd share this amulet with you. It spawns without any +sorc skills. Can somebody confirm this is a bug? I remember it always spawning with +skills. please take a gander at the item changelog and see if this is the way it is supposed to be. I took a quick glance and did not see any of Tal's stuff changed...i could have missed it though. If you see nothing there, I can take a look at the text file. - Chimera located in The Abyss ( Act V) still drops the hellforge hammer. This is especially awesome for new characters. Elite unique claws spawn with +x to A evil Force instead of their proper MA skill (massive problem). 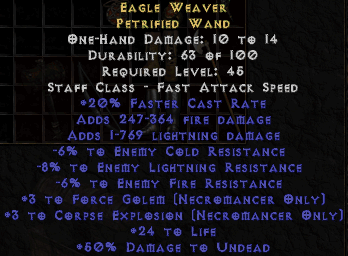 The new unique phoenix claw is named A evil Force and suffers from the same problem. Random claws can spawn with +x to a evil force as well. Vampire Gaze also spawns with +x to an evil force. Do we know what skills are trying to be called on these items that are spawning with 'an evil force'? Seems liked a cloned skill with no description in the table files. +x to an evil force on vamp gaze looks like it's supposed to be "Bone Golem". Not sure what/when/by who it was added. The skill has no skilldesc.txt entry, hence an evil force. You don't actually get the skill because it's not a class skill and the item uses "skill" rather than "oskill" so it won't be applied anyway. If it is to be added, it needs a skilldesc entry and a proper skill icon entry or the game will crash when you open the skill list. Additional bug: Thunder storm calls the skill "Static" for one of it's synergies. Should be "Static Field" so it's only got 1 synergy from Nova at the minute. Any items that spawn with the following skills via staffmods will not get the skill as the skills have been moved out of the grouping. Easier to just add staffmods back onto items and move skills into proper groupings. Rage: It looks like you are fixing the item issues. I will leave this out of the listing since it doesn't seem they are going to be problems much longer. I will edit the post again after these changes are sent through. (like the sound fix that SapphireRawk linked).